“The Reveurs” is French for “the Dreamers”, and this band fittingly presents songs that are nostalgic and sensitive without being too corny. 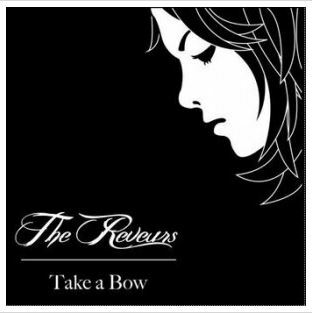 Check out their edgy black-and-white website for gorgeous photos (www.thereveurs.co.uk), and the whole Take a Bow 4-song release – available for listening right online. You can easily order the CD from here, or digitally download it from Google Play. The lead singer has a familiar voice, yet it was hard for me to pin this down for a good comparison – the closest I could determine is that this sounds like the guy from Incubus – when he sings in a slower, mellower way without screaming. Mix that with a little Gavin Rossdale, and you’ve got the idea! In their press pack, the Reveurs are described as “a four piece Manchester based rock/indie band who are committed to writing and performing intense, unique and lyrically engaging indie-rock anthems.” I’m no expert on the lyrically engaging part, the songs seem straightforward and singable enough; but I can attest to the indie-rock part – these guys have got the beat! “Take A Bow” is the opening track of this little 4-song collection, demonstrating a solid sound that is reminiscent of Kings of Leon, and Toad the Wet Sprocket all at the same time – with the aforementioned Bush vocals to keep things going. If this sounds like an unexpected combination, it actually works perfectly! I really enjoyed the second song, called “Harriet” – quick and poppy, like the Strokes with a little old-school Lit which is really fun. Next comes “Control”, a song that turns things to a more serious note in a minor key, with sensitive harmonies and heavy guitars. Here the Reveurs channel some Depeche Mode to appeal to the 80s enthusiasts among us, as they chant “reach out and touch faith” through the intense end of this song. The CD ends with “Saint Marie”; starting with a great bass opening and lots of hi-hat drums, before sliding into awesome rock guitar then quieting down to feature the singer again. Good vocal harmonies lend depth and texture to the determined, repeating lyrics – “Saint Marie I’ve got to run my way; I don’t know what I’ve been told…” that repeat over and over. You could hear this album in a sports bar, in an indie record store, or your own hip car – and the Reveurs wouldn’t be out of place anywhere. I think they are a solid act with some general appeal that could really make it big. Now, we’ve got to get them to play some live shows outside of the UK! *Please note: This piece was originally posted on EarToTheGroundMusic.co on May 3, 2015 – the image shown was captured from that website. The article itself was written by rockmycommute and is subject to my copyright notice as detailed in the About link. This entry was posted in Album Reviews, Emerging Artists. Bookmark the permalink.